<!–[endif]–>BOSTON, January 15, 2009 – Technomad Associates, LLC, a leader in high-powered weatherproof PA systems and communications equipment for military, security and government audio applications, announces that the U.S. Army National Training Center at Ft. Irwin, on the edge of Death Valley in California, is now using up to 30 Technomad Turnkey Military PA Systems.Some of the systems, used for the Brigade Combat Team training program deep in the Mojave Desert, can be seen being used in “Full Battle Rattle,” a two-hour special now airing on the National Geographic Channel.Future showings include Sunday, January 18 at 4pm ET, and Monday, January 19 at 5pm ET. The Brigade Combat Team training program is designed to prepare soldiers for Middle East deployments by injecting realism of the local culture into the training scenario.The Technomad Military PA Systems broadcast religious prayers within simulated Iraqi and Afghani villages featuring Iraqi-American and Afghani-American actors.For most soldiers in the program, this is the last stop prior to deployment, and the experience better prepares them for their missions once in theater. During the second hour (at 1:07) of Full Battle Rattle, audio from the Technomad systems is featured during prayers from a Sunni mosque, demonstrating the clarity of the audio and the large coverage area of the loudspeakers.Technomad loudspeakers are also visible on several rooftops in one of the makeshift villages at the 1:14 mark, demonstrating the durability and weatherproof aspects of the loudspeakers, which sit outside and unprotected from heat, dirt, wind and other elements on a 24/7 basis.At the beginning of the final half-hour (1:28), a temporary application is also demonstrated during a transfer of power ceremony.Four Technomad loudspeakers are raised high on speaker stands, allowing U.S. Army representatives using the PA system to address a large crowd gathered outdoors with clear, intelligible speech. Technomad Military PA Systems are the premier systems for realistic combat simulation and are used around the world on military bases and elsewhere in fixed and mobile applications (ie. as ‘Giant Voice’ or ‘Big Voice’ systems). Other military applications include Sheppard Air Force Base in Texas, which is using a Technomad Military PA System for two courses operated by the Medical Readiness Training Center on the base; and Keesler Air Force Base in Mississippi, which is using multiple Technomad systems for mass notification training. 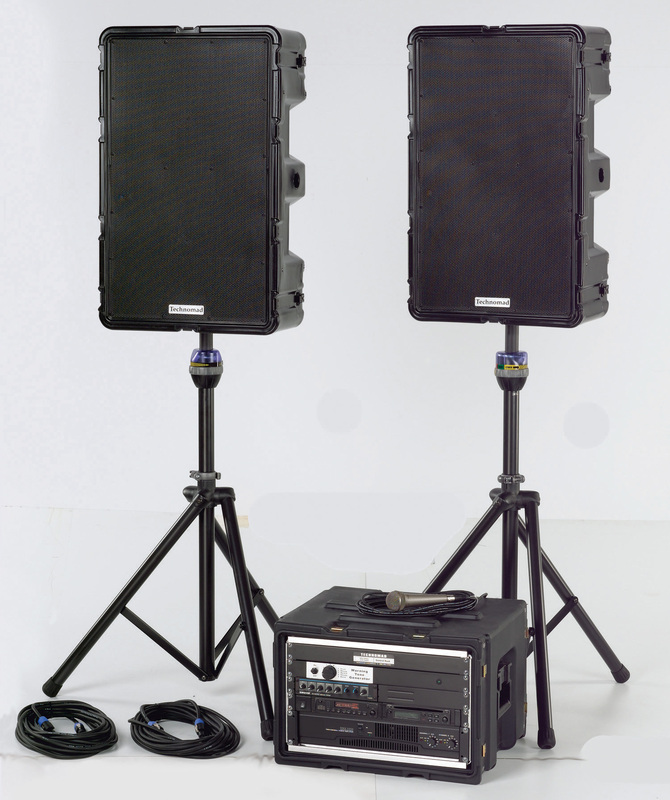 Each Turnkey Military PA system includes a PA control rack with an amplifier, mixer, a dynamic microphone and cables, plus rugged flight-cases with protective gasketed lids that clamp onto the front of each loudspeaker and PA rack when not in use. Technomad also offers a variety of optional technology for its Military PA Systems, including digital link kits to connect large-area, Modular PA Systems; and the Technomad SuperConductor military MP3 player and recording system.The SuperConductor allows users to record field audio for immediate playback from a front-knob position, or scheduled playback of multiple files at any time— without the need for a computer or web browser.